For fifteen years Theo Jansen from Holland has wholeheartedly devoted himself to create a new form of life. 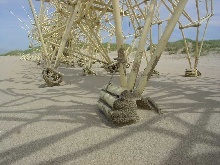 His "Strandbeest" (beach beasts) seem so organic that from a distance they could be mistaken for huge insects or prehistoric mammoth skeletons, but they are made of materials from the industrial age: flexible plastic tubes, adhesive tape. They were born inside a computer as an algorithm, but they do not require engines, sensors or any other type of advanced technology in order to walk.They move thanks to the force of the wind and wet sand they find in their habitat of the Dutch coast. All those who observe for the fist time the beauty of one of Theo Jansen's creatures moving around the sand understand immediately that the work of this engineer, scientist and artist is something special. However, during more than a decade he has remained in the dark and has only recently been discovered by the international art community. In the last decade, dazzled by the digital revolution, his works could seem rudimentary, above all compared to the sofisticated productions his contemporary colleagues have been carrying out in the field of robotic art. 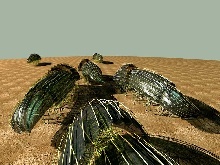 Jansen's creatures begin to take shape as a simulation inside a computer, in the shape of artificial life organisms which compete among themselves to be the quickest. Jansen studies the winning creatures and reconstructs them three-dimensionally with light and flexible tubes, nylon thread and adhesive tape. Those moving around more efficiently will donate their "DNA" (length and disposition of the tubes forming their movable parts) to the following Standbeest generations. Through this process of hybridization and Darwinian evolution, creatures become more and more capable of living in their environment, and can even take decisions to guarantee their survival. 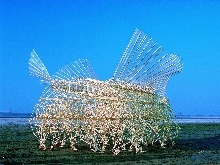 The "Animaris Sabulosa", for instance, buries its nose in the sand to anchor itself when detecting the wind is too strong to be still standing. Jansen is already working on the seventh generation of beach creatures. 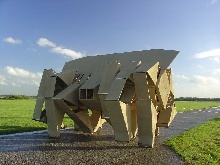 His latest pieces can even carry passengers inside - the "Animaris Rhinozeros, a two ton giant which can be moved just by one person -, reaching those places where there's no wind or sand, thanks to a clever system of impulse based on compressed air stored in soda bottles. In the future, the Dutch artist expects his creations to become more and more anatomically sophisticated: they will develop muscles, a nervous system, and some kind of brain allowing them to take complex decisions. And some day, he hopes his beach creatures won't need him to keep on evolving. Entire herds on the beach will compete for being the fastest and more stable, and will transmit their DNA autonomously to following generations, already completely incorporated in their ecosystem. After leaving his studies in physics, Theo Jansen began his artistic career in the 70s as a painter. Subsequently, he began to be interested in areas such as aeronautics and robotics. His "UFO," a flying saucer shaped airship he used to terrorize the people from the Dutch city of Delft, and his "painting machine", a robot which draws graffitis on a wall, showed his skill to apply his engineering knowledge to different artistic projects. At the beggining of the 80s, Jansen began to create algorithm programs of artificial life simulation. 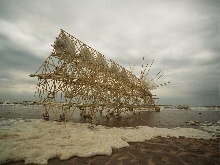 His interest in designing living and autonomous organisms via software made him begin his series of kinetic sculptures "Strandbeest," a project which has brought him international recognition. 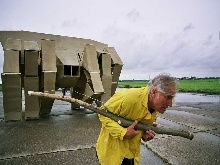 Among other awards, Jansen has received the special jury prize in Ars Electronica 2005. Photographs by Loek van der Klis.